game walkthrough,cheats, hints, tips, solutions and more for everyone! 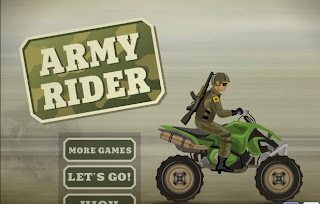 Army Rider is another bike racing game on box10. Ride the soldier out of the woods field with mines and some stunts on your way. You can choose between an ATV or a dirt bike to ride. Also pick up the stars for extra points and other objects hanging in the air like health packs to replenish your health. Please play it nice in the comments! Thank you. All games mentioned in this blog are copyrighted or trademarked by their respective owner(s).. Powered by Blogger.